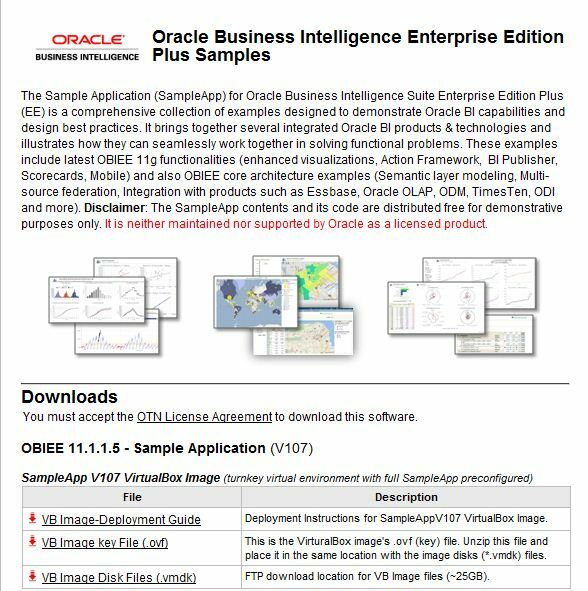 Sometimes thoughts materialize – in this case, I was thinking – wouldn’t it be great if Oracle provided a configured instance of OBIEE 11G – with everything pre-configured so that it’d be easy to get evaluate it quickly without going through the pains of learning new application server (Weblogic) and installation steps. Again, I think it’s very thoughtful and smart move on Oracle’s part to provide this tool. OBIEE Enterprise Methodology Group has some interesting discussions going – for instance, “OBIEE partial & progressive upgrade from 10g to 11g”, “DRM applied to BI”, and “Need to display watermark on dashboard”. We now have more than 400 members – but again, we’re looking for quality, not quantity. If you’re interested – feel free to join – Link to the Group. Just want to remind you that it’s pre-moderated and membership must be approved. 1. Note 740257.1 – How to Increase SAW Logging? 3. Note 823193.1 – How Can We Add Database Hints to Our Custom Reports to Improve Performance? 4. Note 1181263.1 – How Do I Monitor My OBIEE Performance? 5. Note 1096900.1 – How To Troubleshoot Performance issues in OBIEE 10g? 11. Note 1273913.1 – How To Move Or Migrate OBIEE 11g Roles, LDAP Users / Groups From Test To Production Environments. 13. Note 1314357.1 – What SSO Mechanisms are supported in 11.1.1.3 ? 2. 740257.1 How to increase SAW logging? 1. 886493.1 Troubleshooting “You are not currently logged in to the Oracle BI Server” error in OBI when SSO is enabled. 2. 758392.1 How to diagnose “You are not currently logged in to the Oracle BI Server..” error when login from EBS to OBI ? 4. 1067342.1 Is it possible to have 1 rpd and authenticate users from both Siebel and EBS in OBIEE ? 2. 737516.1 Why does Action Link Dropdown not appear ? 2. 1303275.1 Is OBI ReportUI Portlet Supported in OBIEE 11g?